A community of professional archaeologists and volunteers have been working at Shorne Woods, Kent, for over 12 years. Initially the work concentrated on the site of the medieval manor known as ‘Randall Manor’. In more recent years work has expanded to include other sites within Shorne Woods Country Park and the Kent area. At times our team have joined other Kentish archaeology groups in helping them with their projects. The Cobham Landscape Detectives project ran from 2016-2018. It focused on the Cobham landscape, using LiDAR, geophysics, fieldwalking, metal detecting, research, oral history, small scale trenching and test pitting. Look to the ‘Cobham Landscape Detectives‘ page of this website for details. 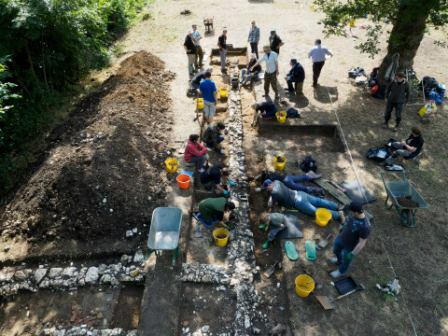 This website aims to publicize the activities of the Shorne Woods Archaeology Group (SWAG) and any Kentish research by individuals within the Group. We also want to show how community archaeology is alive and working in Kent. We meet most weeks, on Wednesday and Thursday at 10am, at Shorne Woods County Park cafe – Brewers Road, Gravesend, Kent, DA12 3HX – but please get in contact if you want to come along as the CLD project is currently taking us to different venues. For our Facebook page click here.